Our two year old grandson came to visit this Christmas. He was intrigued by our German Christmas Pyramid, and he would ask me to light it several times a day. One day, just before Christmas, he came to me and said, “Grandma, can we put the fire on the spin thing?” So, how does a Grandma say no to a request like that…not to mention I love taking pictures of all my grandchildren, and here was another perfect chance. And how sweet is that picture…can you not just see the wonder in his eyes! Well, let me tell you the rest of the story. My camera caught that little boy at just the perfect moment. He was not at all enthralled by the “spin”. 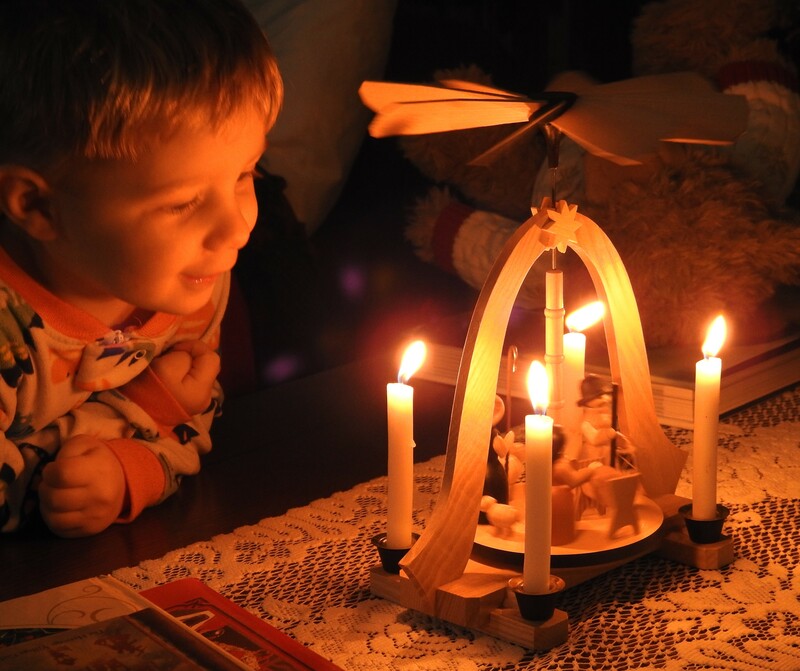 Not two seconds later, his real intention was as clear as the fire on the candle wicks…the real purpose was to light the “spin thing” so he could see how long it would take to blow out all those candles, and to display pride in his accomplishment. Unfortunately, my camera did not capture that expression, but it was equally endearing…because he is a lot like his Daddy. These are the moments I treasure, my most beloved moments, supplied by family.